Former House Speaker Newt Gingrich is heading to Iowa next month to raise money for the Republican Party of Iowa. Washington (CNN) - Former House Speaker Newt Gingrich is heading to Iowa next month to raise money for the Republican Party of Iowa, a GOP source in the state told CNN Friday. Gingrich will visit Cedar Rapids on May 26 as a "special guest" at a fundraising luncheon hosted by Iowa GOP chairman Matt Strawn and House Republican Leader Kraig Paulsen. Republicans who give $500 to the state party will also be given the chance to sit down with the potential 2012 presidential candidate before lunch for a private "Issues and Ideas Roundtable," according to a copy the invitation obtained by CNN. 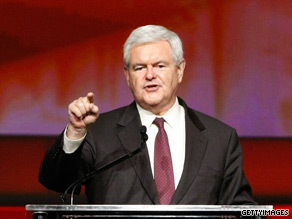 Donors who chip in $1,000 will also nab an autographed copy of Gingrich's latest book. Later that day, Gingrich is also slated to headline a fundraising dinner for the Polk County GOP in Des Moines. His effort to help the party in the first-in-the-nation caucus state is the latest sign that Gingrich is taking the steps necessary to prepare for a presidential run. The former House Speaker has said he is considering a White House bid and will make a final decision about his political future in early 2011. One part of the "contract with America" in 1994 was term limits. They conveniently forgot that part of the contract and many of those who were elected then are still eating at the trough. Will I have to sign a "loyalty oath" too? Newt Gingrich was born Newton McPherson who was a devotee of Isaac Asimov's science fiction,identifying himself as a savior of civilization from cosmic threats.You're going to take this guy seriously? Gingrich-Palin for 2012 now that would be a liberals dream team. It's always amusing how republicans omit the 8 years under Bush and a republican House and Senate who ran our great country off a cliff and the try to blame President Obama. He only talks about Newt and how great things were and then skips over the Bush fiasco years. How very typical. Remember, in NOvember Vote NO to the party of NO. of Young Republicans in 1995 stated,"I think one of the great problems we have in the Republican Party is that we don't encourage you to be nasty".My how things have changed in the fifteen following years. Isn't he right in there with the Wasilla Idiot yelling Spill Baby Spill? Bet those white FL beaches won't be white much longer. Remember, he doesn't need the people, just the corporate cash. The man converted to Catholocism for his third wife, if that isn't textbook hypocracy, I don't know what is. Newt, what makes you think you are still a "player" in GOP politics? Your failed Contract with America should have been called Contract ON America. Your sense of "self importance" is so twisted that you shut down the Federal government to get back at Clinton "because he would not let you ride in the front (with the President) of Air Force ONE". And it really sent you over the edge when you couldn't bring Clinton down for doing the same thing (gettin' some strange) you were doing while in office. That! ....That is hypocritical. And that is why NO ONE is interested in having you back in office. You are the kind of people we want to get rid of that are holding office. The former House Speaker has said he is considering a White House bid and will make a final decision about his political future in early 2011. ****No Way!!!! No How!!!! Issues and Ideas Roundtable? What ideas? Oh yeah, I forgot. Cut taxes for the richest 1% and bomb Iran. Not this guy again!! GOPers, political positions aside, can you offer ANYONE with even a smidgen of integrity and gravitas to us? Are Iowa's Republicans that desperate? Newt is no more that Hannity's sidekick. "We are here because our ancestors or recent immigrants did so with 'fairess' in mind by doing it legally"
Please show us where British imperalism of the 1700's, American expansionism of the 1800's and genocide of the native population were or have been codified as legal activities. What a waste of people's precious time. Breckenridge – considering the mess President Obama inherited, I think he's doing quite well, all things considered. As a Liberal, he isn't quite Liberal enough for me, but I do understand he's everyone's President, not just mine, and have to begrudgingly admire him for it. Dairy Queen? Seriously? You're either sadly misinformed or biased. Until we can all bring something to the table, which your side seems to think is unnecessary, including civility, the gap between us is going to keep growing until we destroy ourselves. Thanks. No More Talky Bad about Wall Street! All Wall Street Hating Corporate Slaves are to turn themselves over to the McSlave Camp for Re-Educating. No More Regulation of Wall Street talk, it's bad, makes all the Corporate Masters Very Angry! You can't win the GAME [Wall Street] when it's rigged! Break Time Over… Get Back to WORK Slaves! P.S. The Corporate Masters are ANGRY at Palin, she is not kicking back some of the BIG $$$ she is pulling down as the Idiot Stooge Mouth Piece of the GOP/Tea Party. This is your final warning Palin-ista or back to woods with you where you belong! P.S.S. The Corporate Masters want to know what is the deal with Palin's look of the stoned bug eyed lack of intelligence of a deer caught in the head lights look on her face? Submit your responses to The Corporate Masters. does anyone else get the impression that the Obama Zombies here are scared to death?? I think the poles that seem to show the Republicans as if they are on the comeback trail are incorrect if these poles are completed over the home telephone since many younger folks have discontinued their land line. I think the poles are taken from the old white folks. They are mostly Republican. I predict a wins in 2012 and 2014 for more moderate candidates without some kind of sinister intervention in the election. There is no promise of honesty in the elections since 2000. We just really don't know how we voted now do we.